Beautiful photographs of the Caribbean Islands grace each card. 54 card deck (including Jokers,13 Clubs, 13 Diamonds, 13 Hearts, and 13 Spades). Go on a cruise around the Caribbean with the beautiful photos of the Caribbean Islands on each card. 54 card deck (including Jokers,13 Clubs, 13 Diamonds, 13 Hearts, and 13 Spades). Play a hand with Islands of the Caribbean. Beautiful photographs of this Tropical Paradise grace each card. 54 card deck (including Jokers,13 Clubs, 13 Diamonds, 13 Hearts, and 13 Spades). Play a hand while looking at scenes from Key West and the Florida Keys. 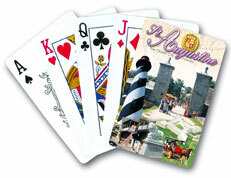 Back of the cards features scenes from St. Augustine.